The aboriginals don’t always dance for the pure joy of movement. The dances are part of the ritual of daily and religious life. A casual observer watching the dancing, however, is left with no doubt that the participants and even the watchers are having a good time. This is a ritual rarely observed by outsiders so it was a special honor to have been invited. While among a large crowd of Navajo men, women and children, we noted that we were the only white visitors attending. I believe the invitation was given after we proved in word and deed to our hosts that we were truly interested in learning about the Navajo culture, and we were not hostile to native belief systems that went beyond the bounds of the white man’s Christian oriented world. The dance had been going on for eight consecutive nights before we arrived. We came on the final night. This was a time when the dancers appeared in full regalia, wearing eerie costumes that gave them an alien appearance in the light of the large bonfires surrounding the dance area. The dancing began at about midnight and continued until dawn. The dance was held at an isolated place, miles from any sign of civilization. To get there, we drove a maze of dirt trails, all cut so deeply in the dry red desert clay that at times the car headlights gave us a feeling that we were moving through a tunnel. At last, we arrived at an isolated Navajo house. The dancers were gathered around a nearby Hogan. Several large bonfires already were lighting the sky in a nearby field. Ye’ii Bi’cheii dances are held during the winter months. We were there in January. Even though this was Arizona, the high desert where the Navajo live, at an altitude of about 7,000 feet, gets bitterly cold. We came bundled for the cold. I was wearing thermal underwear, dungarees, a heavy wool shirt, a thin winter coat, and over this, a thick winter goose down coat. Gloves and a wool scarf wrapped around my ears and neck, and a leather western style hat covered my head. Even with this, I found comfort standing close to the bonfires. We were warned that we were attending a most solemn event. Yet there was no doubt that the people present lacked all the reverence they were supposed to have. There was an air of gaiety and celebration, as if the people were gathering on any street in America to watch a parade. They brought folding chairs, wrapped themselves in brightly colored Navajo blankets, and munched on hot-dogs, hamburgers and fry bread. The food was sold at two portable concession stands. They stood in the arena on a large furry buffalo hide. Out of the darkness emerged a line of Ye’ii Bi’cheii. 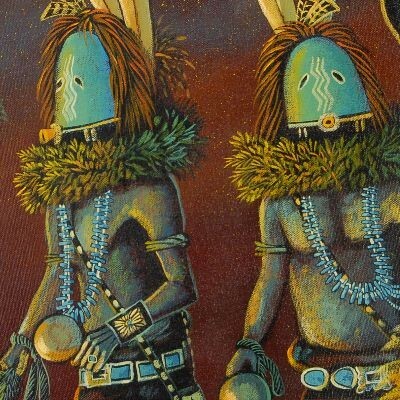 These mythical beings, according to Navajo legend, are something comparable to powerful demons in the Christian realm. They had the power to do terrible things, even kill. But if appeased in a special way, the Ye’ii Bi’cheii also can heal and bring benefit to those who knew how to ask. The kilts were short, stopping just above the knees. The dancers wore tan leather boots that came up over their calves. At their back, fox pelts hung from the waist. In each right hand was a large rattle made of gourds. The men’s bare skin at the chest was dabbed with white clay that made them appear ghostly and somewhat surreal. The head pieces were turquoise, oval and distorted. They appeared to be made of clay and covered the entire head. Tiny slits were cut for the eyes and at the bottom of what should have been the face hung a large dark purple bulb looking much like a clown’s nose, except that it was squared off at the tip. Leading this strange lineup was the camelback, another mystical being depicted on Native American art throughout the southwest. This strange fellow was bent over, with his back arched. A line of feathers decorated his body from head to feet. We were told that his appearance was an extremely rare event and we were honored to be allowed to see him. I have yet to understand the significance of his showing. Yet another odd character trailed the line of dancers. He was a true clown. The Hopi call this odd fellow a Qaletaqa, or Guardian. He is always a member of the Coyote Clan. His mask was white and his head was adorned with a spray of eagle feathers. He was dressed in dungarees. A bright blanket was wrapped over his shoulders. It was soon apparent, after watching his antics that this character’s purpose was to distract the minds of the watchers. It was a form of crowd control, so that collective mental energy would not interfere with the magical work going on in the center of the arena. This little guy, probably no older than a boy of 16, grabbed people’s hats, flirted with the ladies, and caused as much silent ruckus as possible without interrupting the dance. The Ye’ii Bi’cheii continued circling the arena four times before coming to a stop. Then the dancers began walking off into the night as if they were about to leave. Suddenly they stopped, turned around, and returned in single file back to where they started. Again the two patients blessed them with a sprinkling of corn, and the ritual was repeated. This continued for four consecutive times. Then the dancers disappeared into the darkness. More prayers were chanted in the Hogan. Then more dancers appeared, and the same ritual was repeated. It was impossible to tell if they were the same dancers or new ones. This continued throughout the night until dawn. At one time, young girls joined the male dancers. They, like the men, wore turquoise masks, although their masks were not quite as grotesque. The girls, who were probably all in their early teens, wore black dresses with bright red symbols. They had bright belts with silver inlay around their waists, and they wore white boots. Their appearance was a colorful addition to the night’s event. We learned that women rarely appear in Ye’iiBi’cheii dances. I had the distinct feeling that we were being entertained as special guests. The ritual affected all of us. One can watch films of such dancing and listen to taped versions of the chants, but until you are there to personally see it, one cannot sense the power of the ritual. Doris and I were stunned by the spiritual power and sheer beauty of what we were allowed to see and feel that night. There is a story among the Navajo that the dancers must keep their lives in order both prior to and for many days following a Ye’ii Bi’cheii ceremony. Any infraction of the rule could cause the illness removed from the sick patient to fall upon the violator.